The U.S. Consumer Product Safety Commission in cooperation with Kiddieland Toys Limited, of Scituate, Mass. (Note: Disney licensed their brand name to Kiddieland.) have recalled about 12,000 (9,000 Disney Princess Trikes were recalled in April 2011*) Disney Fairies Plastic Racing Trikes. The plastic fairy figures protrude from the top of the handle bar posing a laceration hazard if a child falls on them. CPSC and Kiddieland have received one report of a 3-year-old girl from Ohio who suffered a facial laceration near her right eye. 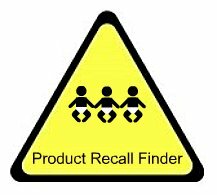 This recall involves the Disney-branded Fairies Plastic Racing Trike. 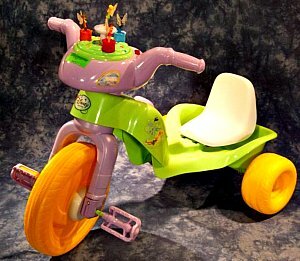 The trike is green and purple with a white seat and yellow wheels. On top of the handlebar, there is a Tinkerbell figure and three other rotating fairy figures. "Disney Fairies" is printed on the label in front of the trike just below the handlebar. *New model Princess Trikes do not have figurines and are not included in the recall. The Disney Fairies Plastic Racing Trikes were sold at arget stores nationwide from July 2009 through December 2009 for about $50. They were manufactured in China. Consumers should immediately take the trikes away from children and contact Kiddieland for a free replacement handlebar with an enclosed rotating display.